We recently returned from a trip to Mexico. 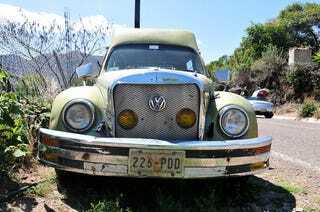 This Volkswagen Beetle was sitting by the road on part of the old Carrera Panamericana route. Think the nose looks weird? Wait 'til you check out the car's back half. Arriba fahrvergnügen! Yep, that's right — it's a bus. A bus! Pickup mirrors, rubber hood straps, and a bumper big enough to fend off the Queen Mary? Why not? Every third car in Mexico City may be a Beetle, but every tenth car in Mexico's interior is one of these funkmonkeys. Much like the V-6-powered Alfabike, this sort of thing needs no explanation; it just is. And we love it. If you know more about this happy little chunk of disaster — low-production Mexi conversion model? what happens when you feed the ghost of Dr. Ing. h.c.F. a bit too much lysergic muy bueno? — feel free to clue us in. In the meantime, we're going to sit here and try to think up new Beatles/Beetles puns. If you're lucky, we won't share 'em. Maybe.